Take a quick tour of Microsoft Teams. Microsoft Teams is a new collaboration tool built on the Office 365 for Business Platform. Using Microsoft Teams, all your team conversations, related files, notes, and content are kept together in one place and easily accessible by everyone on the team. 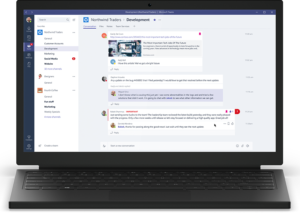 Microsoft Teams is an entirely new experience that brings together people, conversations and content—along with the tools that teams need—so they can easily collaborate to achieve more. Word, Excel, PowerPoint, SharePoint, OneNote, Planner, Power BI and Delve are all built into Microsoft Teams so people have all the information and tools they need at their fingertips. The Microsoft Teams workspace can be customised to quickly access key documents and tools, explore data and get updates from the apps your teams uses every day.